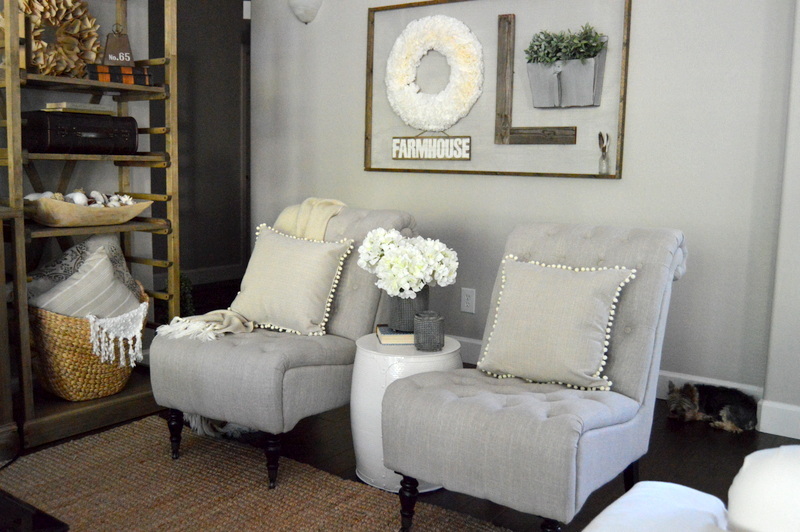 I was so excited to share some of the fun farmhouse/cottage touches I’ve added to my family room – but when I went to edit my photos for this post, they were so dark and blurry, I almost cried! Normally I would just re-shoot them and go about my day, but I waited until the last minute this time, and it happened to be at 6:00 in the morning (before I left for the day job), on an overcast day! Ahhh!! Oh well, not much I can do about it except apologize. I finally got the bookshelves styled and decided to address the huge, empty wall in my family room. If you follow me on Instagram , you know that I attempted to hang a clock there, but it didn’t look so good, so down it came. A few weeks later, I decided that a vintage screen might work, filled with goodies that I could switch out with the seasons. After unsuccessfully searching for one that would be big enough, in my price range, I gave up and decided to make my own. No, it’s not vintage, but it gives the same effect and fills up the wall nicely. 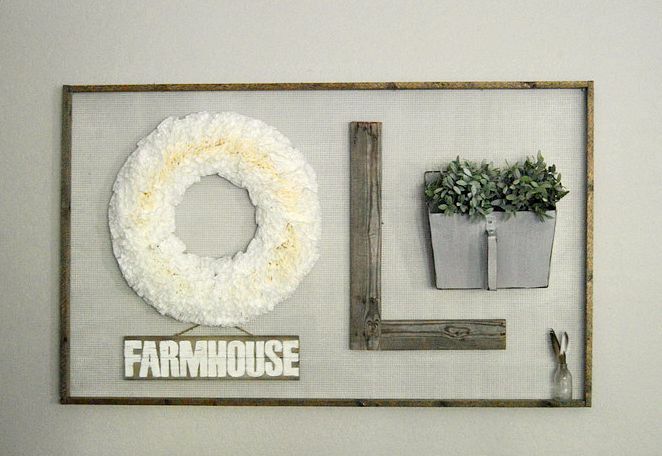 I moved my coffee filter wreath from the entryway and had the mister make me a large letter L from a pallet board. 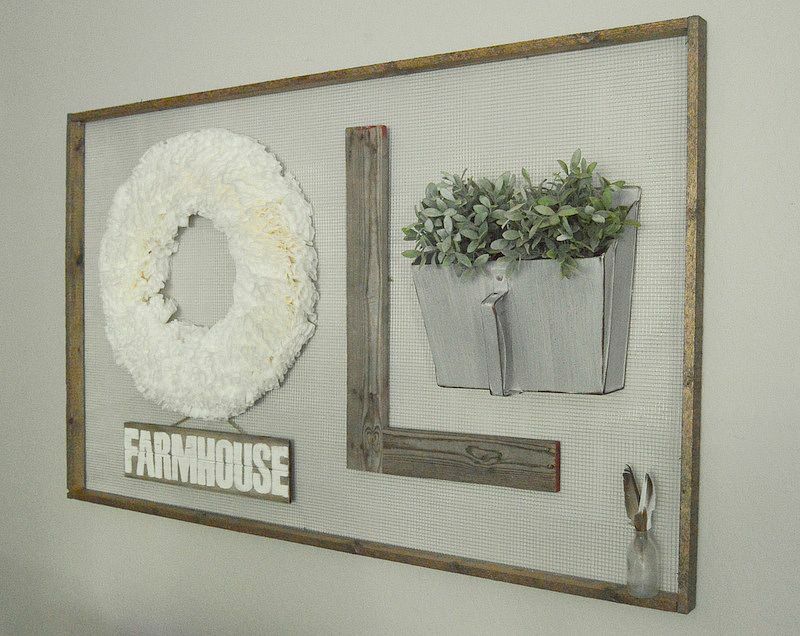 The “farmhouse” sign I painted, and the dustpan was a recent purchase for a super-secret project I’ve been hinting around at. I’m not quite ready to spill the beans yet, but believe me, I’m so excited about this one! I’m happy to finally have this wall nearly finished! I think it needs a few smaller pieces on either side of the screen, but I’m going to live with it for a bit and see if I change my mind. I think the next project I’ll be working on is learning how to use my camera in manual mode. I’ve been putting it off because we get so much sunshine here, it’s easy to get decent shots with my Nikkon; but obviously the time has come to take off the training wheels. Can anyone recommend a good photography course? I’d love to hear what you think about the farmhouse updates, and any photography recommendations you may have! 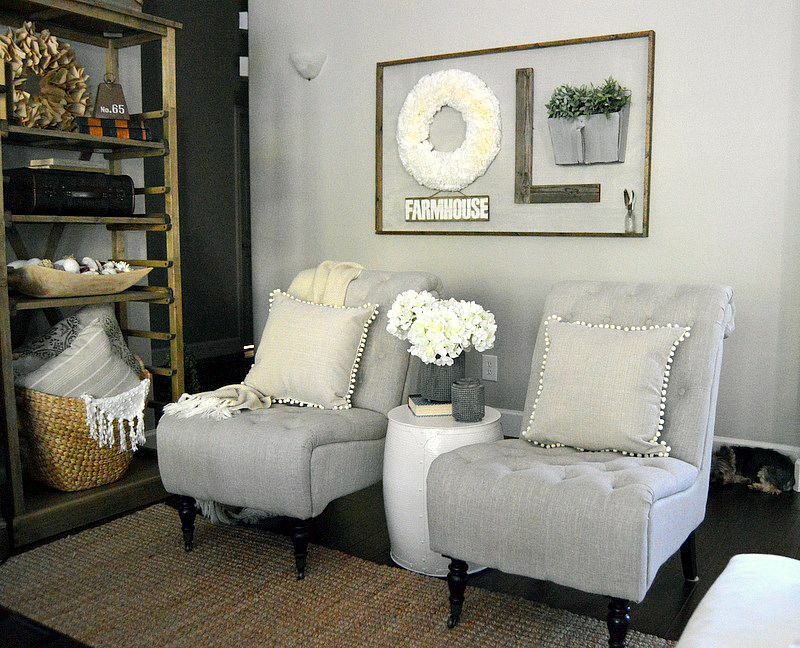 I love the little farmhouse gallery wall..I mean those accessories are ADORABLE & I LOVE the pillows..basically I love everything in these pictures !! Have a great rest of the week Amy!! Amy that looks incredible !!!! How did I miss that post??? What a creative way to hang those items!!!! PINNING!!! LUV IT!!!!! Thank you, Jenna! I’m getting ready to add a few fall touches this week! I can’t wait to post about it!